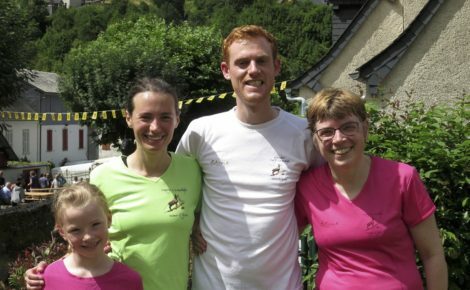 Richard Keep reports on a French adventure: Last year I watched on as a stream of brave runners rounded the final corner of the Course a la Montagne d’Etsaut surging onwards and steeply downwards to the finish line at the annual Etsaut cheese festival, partly annoyed to be injured, partly massively relieved to have not run the 3.8km mountain course. The runners returned, each to a hero’s welcome, lavished in glory and prizes. Emily Holden and Sam Gallagher, running in teal, held their own among the local shepherds and seasoned mountain runners. I said to myself, next year that would be me. I thought about this as I drove along the twisting mountain roads, it was Etsaut Fete du Fromage 2016 and that meant mountain race day. Things weren’t quite going to plan, our meal the previous night had been high on carbs but also high on the Bordeaux. Emily had arrived late the previous night, having just cycled two of the Tour de France’s hardest climbs in Col du Tormalet and Col d’Aubisque. Sam had spent part of the morning searching for her teal vest, it was nowhere to be seen. Not to worry. We had arrived in plenty of time to sort ourselves out. We walked through the village to be confronted by a line of runners, race numbers on, ready for the off. Cue manic filling out of race registration forms, passports slamming down on the registration desk. In the background I hear the announcer, something about “les Anglais” and “une pause”. Cue muttering and friendly jibes from the watching locals and assembled runners. No time to hydrate…but surely time for a pre-race comfort stop? Wild gesticulation came back as the answer from the race organisers, clearly eager to get the race underway, as we frantically tried to locate the toilets. I think back to last year and the glory of the finish, there was nothing glorious about this so far. The next thing I know we’re off on the ceremonial lap of the village. “Allez! Allez! Allez!” come the cheers of the crowd. “Where’s Sam? !” comes the call from within the pack, it’s busy and tight and there’s jostling for position before we get to the narrow mountain path. And steps, they take me by surprise as we round a corner. “She’s still in the bog! !” comes the reply. We cross the village square, past the sheep in their pens and the cheese making demonstration, the mountain path is ahead of us. And there’s Sam, patiently waiting to join the runners before the real race begins. We plunge into the cool shade of the forest and the path begins to wind upwards. Instantly, my mouth’s dry, my legs are heavy, my lungs are failing to fill quickly enough. I look at my watch to see how far I’ve run, it stares blankly back at me “Getting location”. It’s steep and then gets steeper for the switch back turns, all I see is dirt and tree roots and the occasional legs of the runner in front of me. I pass a Frenchman in his 50’s, then instantly regret the effort it took. Still the path climbs. We’re all walking now, the initial energy sapped by the gradient. I decide to mimic those around me, run when they run, walk when they walk. I adopt what seems to be the most popular walking position, bent double, panting, with hands on knees, pushing myself up. I glance again at my watch, “Getting location”. The path climbs further, surely I must be near the end of the first section of the 274m climb. Suddenly the path levels off and the runners ahead of me bolt off into a run, I force my legs to pick up the pace, only for the climbing to continue. I had done some prep. I knew there were two sections of uphill separated by a downhill and then a downhill on the road to finish. It was mind over matter, willing my legs on, waiting for the downhill. As it turned out the downhill was treacherous and there were three sections of uphill. I get to the end of the second uphill and begin my descent expecting to hit a road, instead more tree roots and ankle twisting drops, followed by the third uphill! Mentally crushing, instant heartbreak, my lungs fill and exhale with laboured frequency … the Frenchman in his 50’s passes me. I glimpse a view of the village far below me, the green mountains, the blue sky, the burning sun, I’ll think about that view later. My watch beeps, it’s finally found my location. Then we hit the road, wonderful tarmac, I know this surface, hard and smooth. My feet burn, can feet catch fire? Is that a thing? I let gravity take me down the beautiful tarmac road, lengthening my stride, this is the final push for the line. I re-overtake the Frenchman in his 50’s. Before I know it I round one final hairpin and i’m spat out into the village, I spot our friends cheering on the corner where I’d stood last year. Only 50m and the pain will be over. I push for the line, for glory. I cross the line and sweat and pant and gasp for air. I’m never doing that again. Or maybe I will. A cold beer, a baguette. Suddenly the race doesn’t seem that hard. “Le Premier Anglais” I hear as I accept my prize. 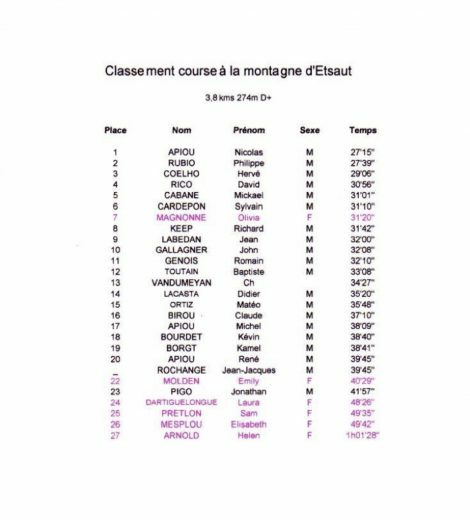 Next year I’ll hydrate, I’ll stay off the wine, I’ll arrive in plenty of time, I’ll do a warm up, I’ll buy some trail shoes, I’ll do some hill training… I see the top three finishers accept their trophies. Next year, that could be me. So you’ll do anything for a cold beer and a baguette, eh? I’ll bear that in mind, Rik. Super racing and super reporting! Well done all of you! Well done all of you – sounds brilliant! And I’ll look forward to yet another brilliant race report from this race. Sounds like a great time was had by all – well done!